What am I going to have for breakfast? This is often times thought about before even climbing out of bed. I’m sure the usual comes to mind of Cereal, coffee, toasts, maybe even the “on the way to work Starbucks” is on your normal go to list. How about something healthier and homemade for a change in your normal routine? Make these Delicious Breakfast Egg Muffins TOMORROW morning and you will never go back to the cereal days. Breakfast is said to be the most important meal of the day so why not use that meal to really fuel your body for the rest of the day. These muffins are so simple. They are almost an entire breakfast all in a muffin. Individually sized hash browns, ham, and eggs all in a muffin pan. We often times make breakfast for dinner. My family loves it and thinks its a real treat when we do this. The kids love to help and be in the kitchen. It’s a great skill for them to tackle early on in life. Breakfast Egg Muffins are kid friendly and approved. Give them a try and let us know your thoughts. Did you change anything or add anything to the recipe? Once the 30 minutes is up, pull out and using the back of the spoon, make a cavity for the ham. Let cool for 5 minutes before serving! 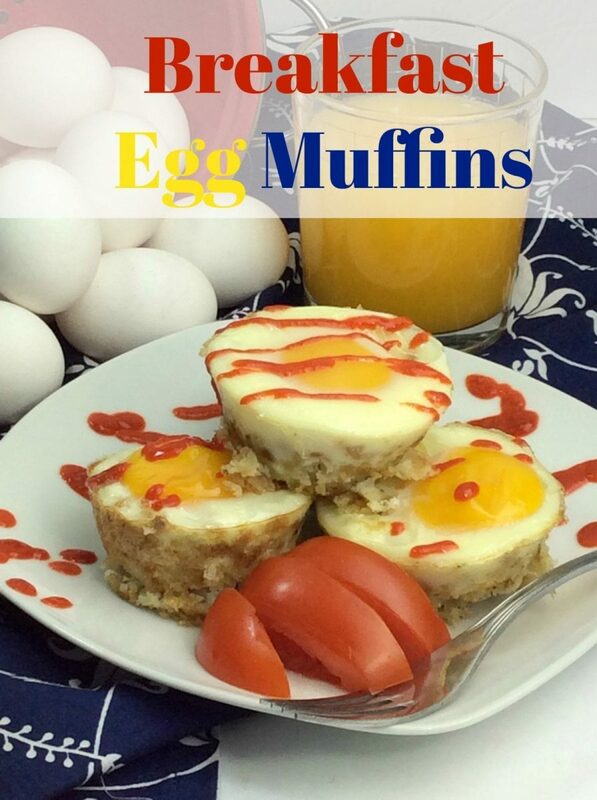 I hope you enjoyed the Breakfast Egg Muffins Recipe. If you make it, make sure to share with us on Facebook or Twitter! Also, check out all of our other Recipes. Let me know who you liked them! We done different versions of this great recipe! been a long while though, I should change that. Hoping you will like it! These look really good, I would enjoy these even for a snack! Eggs are my favorite.. these look tasty. This looks like something my daughter would really enjoy! I love low maintenance meals that are easily put together and baked in the oven. This is such a fun, yummy variation on the breakfast muffin. My kids would love these. This looks like they would make a tasty breakfast. I want to give them a try and have saved the recipe. hThank you. I love shredded hash browns, I will have to try this breakfast. These look so yummy! Breakfast is definitely my favourite meal 🙂 Thank you! Oh yum with hash browns did mine with turkey bacon, hash browns sound way better. Yummy to add turkey bacon! It’s all good with eggs! I love adding the hash browns to the eggs. An easy breakfast! Breakfast is definitely my favourite meal but I get sick of the same thing all the time . Will pin these to make in the weekend , they look so good . These are very quick and easy to make and would be awesome for breakfast. These look tasty and nutricious.I like that it is practically a hands free way to make breakfast which is always nice too especially if you are busy or have company. Thanks for sharing. Oh yummy,I just might try these for dinner! I’m shocked my picky eater grandson asked for seconds……….this is a keeper!